Recently we are encountering a several forms of hacking, taking forms in non official emails delivered to our customers, scamming and other type or hacking. We are doing our best to counterattack the frauders, but we need your cooperation and be part of this fight!!! . Please if you got any suspicious emails, phone calls asking you a payment under TAU CORPORATION’s name, kindly think twice before you proceed. Frauders are using email address to divert customer’s attention. The email domain used to communicate with customer is @tau.co.jp. We never use Gmail, Yahoo or other domain. So please keep this in your mind. This above email address was asking our customer to make all his future payment to non official bank account. Please make sure to check all time our official bank details before you make any action. To counterattack fraudulent payment,Telegraphic Transfer rules is now updated kindly read the bellow carefully . In case we cannot establish a Link between the invoice name (buyer) and the payer (remitter) , the payment will be rejected. All time double check any information you got it new. Please manage your email box carefully, make sure that you are communicating with the real TAU SALES STAFF. We sell only thru our official website www.tau-trade.com. And if you have any doubt, please make a direct call or email to us for final confirmation. 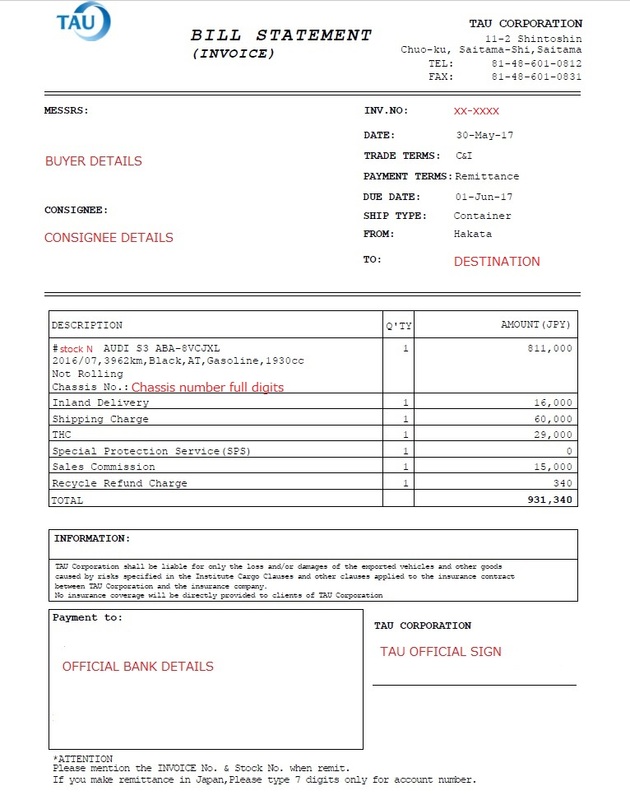 PLEASE MAKE SURE TO GET THE REAL INVOICE .We only issue customer invoices thru (MY PAGE) .We never send print or other forms of invoices.Bellow is an example of fake invoices.Please be aware !! If you have any question regarding this matter , please contact us and we can make things clear for you . Features of MOLYGREEN:"MOLYGREEN" series lubricants for vehicles have been developed based on the concept of achieving high performance and environment adaptability. "MOLYGREEN" is PALSTAR's coined brand name by combining Japanese term "MOLY" that means the forests with "GREEN" from the color image of the beautiful nature. Worldwide Delivery : As Pioneer leader of Damaged/Used cars business in Japan, TAU CORPORATION provides a large selection of used parts and new ones available for worldwide delivery. Daily updates of stocks and a wide connections with Japan top leaders in the field. We do both retail and bulk .